Consider this recipe for a startup crepe business. 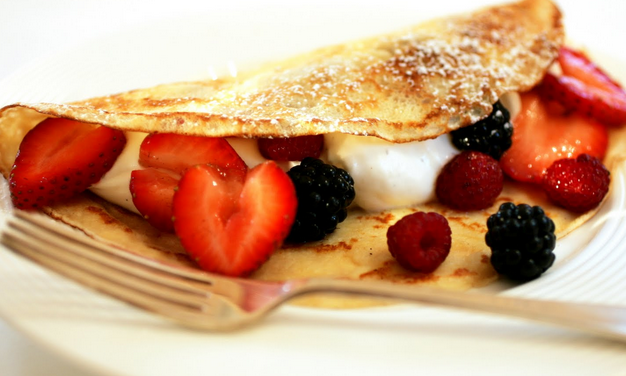 <>Crepes are thin pancake-like desserts that are usually filled with different kinds of fruits and topped off with chocolate or strawberry syrup. These delectable desserts are perfect if you’re craving for some fresh concoction of fruits. These are also present in most occasions like weddings and debuts and are usually set-up on a dessert buffet station. You’ll be surprised with how crepes are made—it’s simple and easy! You can even customize the fillings you want to include in your own business (so that you’ll also have a brand identity). Here’s a recipe on how to make crepe. 1. In a bowl, combine melted butter and eggs. Beat it until the eggs are fully mixed. 2. Add flour, sugar, water, salt, and milk. Mix up slowly until the chunks are melted. 3. Pour the batter into a non-stick pan and let it cook for a while until it gets brown. 4. For the filling, you may add whatever fruits and syrup you like.